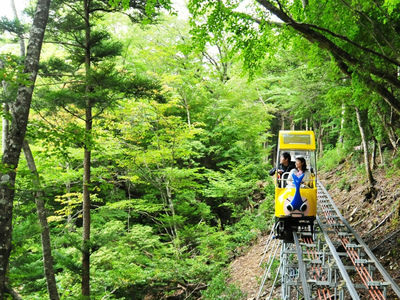 Leaving from the base of the Iyashi no Onsen-kyo Hot Springs area, this monorail weaves a trail over 4.6 km through the forests of the Iya Valley, with various terrain at heights differing up to 590m and steep cliffs nearly 40 degrees! All up, the tour takes approximately 70 minutes. [:enTake the Shikoku Kotsu Bus, either "Kubo-iki" On the way, transfers to the city bus. transfer to city bus (approx. 2 hours and 7 mins). Get off at the bus stop "Sugeoi" then walk for 20 minutes.